The following is an announcement of alternative arrangements of God Defend New Zealand, for general use. Source: the Supplement to the New Zealand Gazette, Thursday, 31 May 1979. 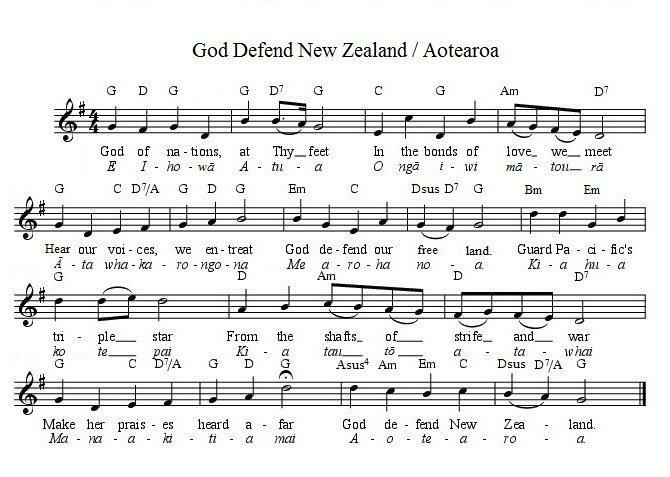 Recognising the difficulties which could be experienced in the singing or playing of the national anthem God Defend New Zealand by the general public, new arrangements of this anthem have been commissioned from Mr A Maxwell Fernie. The original score composed in 1875 by Mr J. J. Woods in A flat (concert pitch) lent itself best to solo or choral singing but was not most appropriate for general or massed singing, bearing present tastes in music in mind. The new arrangements allow for a strong presentation at a reasonable pace. One is more suitable for massed singing, the other for choral work. The commissioning and publication of these arrangements is intended to enhance the presentation of the national anthem for general purposes. They should not be regarded as the only arrangements suitable for all occasions. This page notes that the recommended key for massed singing is G major, and that the National Anthem should be performed at a tempo of 108 beats per minute (bpm). Our sound files page provides audio files in a range of keys and tempos, and some modulate up between the verses in Māori and English. Here is a musical score for God Defend New Zealand for the guitar in G major. Click here for a larger version of the above music score. The following first score has been scanned directly from the New Zealand Gazette.